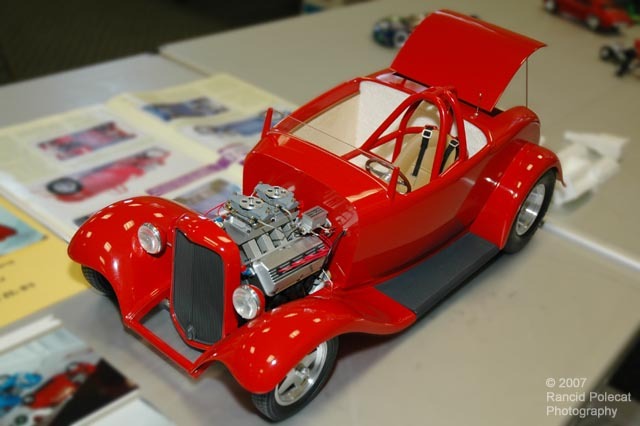 After this 1/8 scale 1932 Ford and its blue sister pickup made a huge splash in the February 1994 issue of Scale Auto Enthusiast Magazine, they both ended up in the care of famed 1/8 scale resin caster, George Zurowski of "Let's Get Small". At the time of his passing, George had begun disassembling the model to take molds from the engine parts. His wife, Pat, kept the engineless model in it's display case for years. Good friend Norman Veber of the Replicas and Miniatures Company of Maryland received Pat's approval to complete the task of taking the engine molds, then reassembling the car for her. This proved easier said than done. A few parts could not be accounted for. Norman found most were relatively easy to reproduce. The one part that was distinctly not easy to reproduce was the front engine plate, which features integral mounts to secure the engine to the chassis as well as being the mounting point for several other parts. Armed with his own original photos of the car taken in the 90's, the above referenced magazine article, and some modeler's intuition, Norman machined an all-new front engine plate.